We believe everyone deserves to enjoy a worry free retirement! Our financial advisors plan traditions of wealth. They strategize to grow, preserve, and protect their clients' invested assets. They help retirees safeguard their money through the use of tax-advantaged fixed and insured accounts. They show young families and couples ways to accumulate wealth through long-term investments, and introduce them to effective ways to fund the cost of college. They advise business owners to reduce taxes and build wealth faster through supplemental retirement accounts, so that they can exit their company or practice with more liquidity. They help people protect and grow wealth through the changing times and reach lifelong financial objectives. Changing jobs? Starting over? We can answer all your questions and make rolling over your 401k a snap! Enjoy the freedom you deserve in retirement without the worry of running out of money. Get your personal Income for Life Plan today! Turn college dreams into reality. If you need Long-Term Care, who will pay for it? At least 70% of people over 65 will need long term care services at some point in their lives. 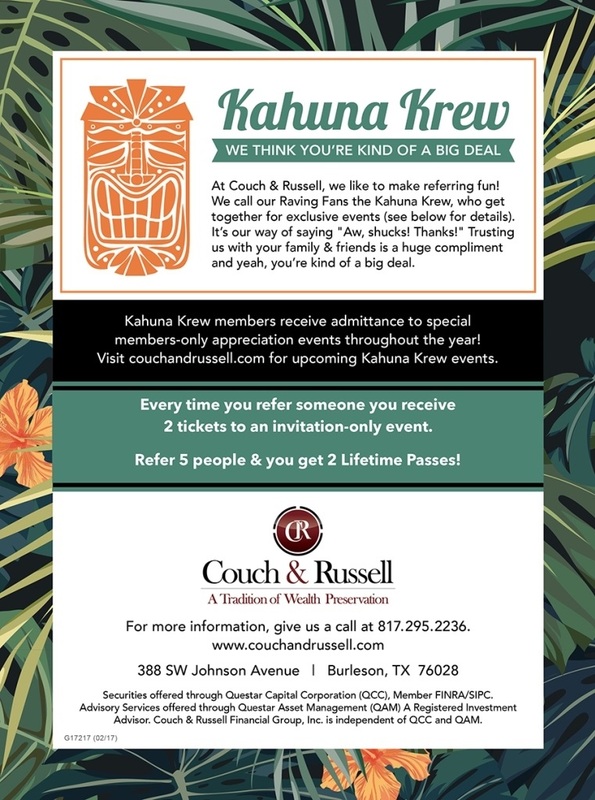 Check out our Referral Program>>> Kahuna Krew!